In September 2013 - one year ago this month - my hometown of Lyons, Colorado, endured epic flooding. September is usually a dry and stable weather month in Colorado, but extraordinary meteorological conditions set up to produce what the National Weather Service described as "biblical rainfall" in the mountainous area west of Lyons. The stalled storm and steep topography provided a particularly violent combination, producing widespread property damage and taking a number of lives along Colorado's Front Range. Please consider contributing to this very worthy project! An effect that I'm particularly fond of for emphasizing terrain steepness is the "terrain morph." The idea is to transition from a flat surface into the 3D topographic view through a smooth series of steps as in this post. Here's a nice example showing Longs Peak, Colorado. Click through to the high def version to get the full experience. I really like the "old school / new school" metaphor as well. The initial flat quad map has been around forever, but has now given way to interactive 3D views with textured high resolution imagery. I've previously posted on the beautiful Alpine Loop Back Country Byway. Traveling southwest out of Lake City, you pass picturesque Lake San Cristobal - Colorado's 2nd largest natural lake. 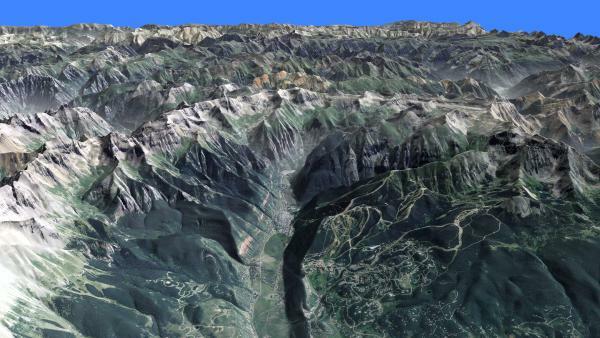 Here's an edWare3D rendering looking NNW along the Lake Fork of the Gunnison River showing the lake. It also wonderfully illustrates the reason the lake's there - the Slumgullion Slide dammed the river. Here's a great resource for those interested in learning more about the slide. The landslide episode that created the dam occurred about 700 years ago. A section of the slide is still active. Here's another rendering showing the active portion in red, with the inactive portions in blue. The Big Horn Basin must be the superimposed river capital of the world. Superimposed rivers are named such because they're superimposed over complex topography, often with bewildering results. The river establishes a course, then regional uplift uncovers geological obstacles. The river down-cuts through strata along its path producing head-scratching topographic features. This map (thanks Heidi!) shows the setting in north-central Wyoming. Arrows mark locations where river superimposition occurs; edWare3D images of these locales are shown below. From Boysen Reservoir, the Wind River cuts through the Owl Creek Mountains forming the Wind River Canyon on its way into the Big Horn Basin. So downstream is into the mountains from the Wind River Basin. I've always been disoriented driving through this Canyon. The water looks like it's flowing uphill! This animation circles Boysen Reservoir. Remember that downstream is into the mountains. The Wind River becomes the Big Horn River in the Big Horn Basin. On the west side of the Big Horn Basin, the Shoshone River exits Buffalo Bill Reservoir and cuts the Shoshone River Canyon near Cody, WY. It's incredible that the river doesn't flow slightly south (left in the image) through gentle terrain. Back along the Big Horn River, here are views of cuts through Sheep Mountain and Little Sheep Mountain. Both these landforms are anticlines - upfolded structures with oldest strata at their cores. It's only appropriate that the Big Horn River be superimposed where it exits the Basin as well - and it's a spectacular example. Here's Big Horn Lake in Big Horn Canyon along the Big Horn River through the Big Horn Mountains leaving Big Horn Basin. I think I see a naming trend here! For anyone who's interested in the world's geological wonders, this area is well worth a visit. In my last post, I looked at some unusual options for visualizing subsurface phenomena. The subsurface bodies in that example, which might represent pollutant plumes or ore bodies, were generated as isosurfaces from fractal volumes. Model data is courtesy of Jian-Wen Bao of the National Oceanic and Atmospheric Administration (NOAA). The gray atmospheric "body" shows the 25 m/s isosurface generated from model output for a time slice on Aug 29, 2005. The core of the high wind area engulfs New Orleans, LA, with the well-known tragic results. You can view a small-sized version of the animation in the "Volume Modeling" section of our animations page. I've added a grid to try to help orient, but it just doesn't work for me. The lake in the lower left looks like it's below the level of the subsurface features (the subsurface features are actually set back quite a ways.) Obviously I would need to work a lot on depth cues to make this usable. I've come up with two other ideas that I haven't seen used. One is the "porthole to the beyond" effect (poke a hole in the z-buffer and fly on in); another is the "sinkhole" or "melting mountains" effect. Here's an animation that shows them both. It begins with the "porthole" effect, flying into a polygonal hole in the landscape. After breaking back through the surface, it flies to an overview showing the "sinkhole" mode. It's still pretty disorienting, but I really like the effects! You'll need to click through to read the text. 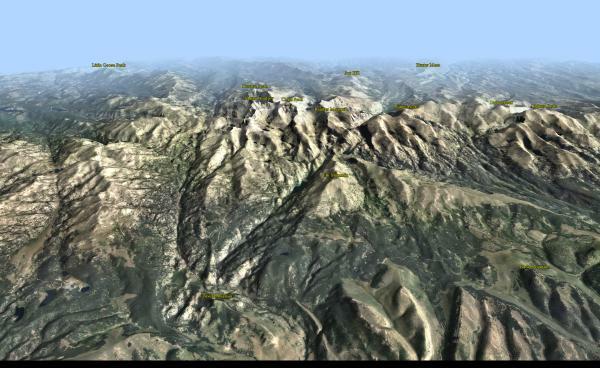 Summits are labeled with coordinates from the USGS GNIS database, briefly described in this post. Low sun from the south helps to highlight the E-W trending ridgelines in the foreground. Clear air keeps things crisp up to the summit crest; attenuation gracefully subdues the background. I've posted previously on using lighting and attenuation to simulate weather conditions in landscape rendering. This post expands on that topic. The left image - Crested Butte Sunrise - utilizes low (in the sky) red-hued lighting out of the East (viewer's right) and a dark blue sky. The diffuse reflection component is set high, while ambient (background) light is low. Attenuation is non-existent. It gives me the feel of being out at dawn on a crystal clear summer morning.  The right image - Whiteout! - takes a slightly different viewing perspective with much different atmospherics. Extreme attenuation causes very limited visibility. Ambient light dominates. Saturation of the color bands is near zero. This one reminds me of some "white knuckle" winter driving days in the mountains! 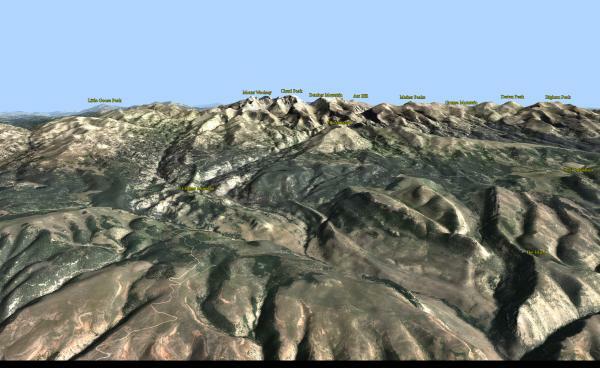 Peakfinders show near ground views of an area's mountain backdrop with prominent landforms labeled. Peakfinders help residents and visitors learn about their geography and have been one of our most popular and requested products from customers. These can be generated from photographs, artist renditions or - in our case - computer renderings. The Sandia Mountains tower over Albuquerque - New Mexico's largest city. The range offers outstanding rock climbing, hiking and the memorable Sandia Crest National Scenic Byway. Although it's been many years since I've visited the crest, the view over Albuquerque remains etched in my mind. Stark orange-hued lighting illuminates the range and the City in the foreground. 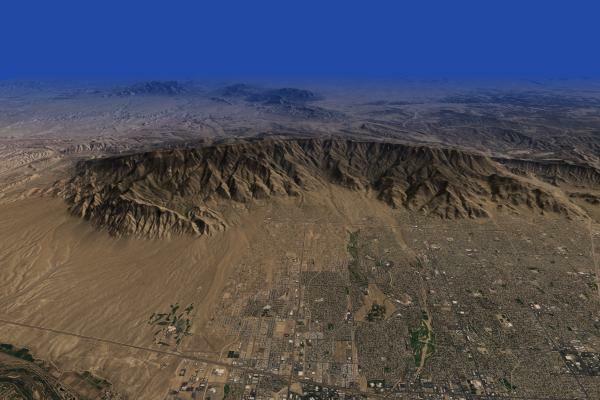 It gives way in the distance to a deep blue attenuation designed to help highlight the Ortiz and San Pedro Mountains, and other landforms to the east. I really like the way this lighting / attenuation combination highlights the ridge crest, which otherwise could easily be lost in the background terrain. 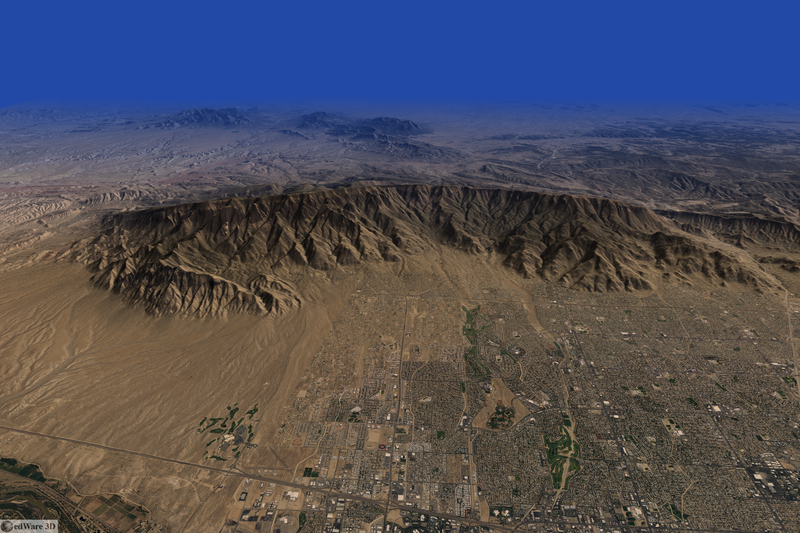 The 1m resolution NAIP imagery provides nice detail of Albuquerque's urban landscape. Here's my shot at a computer rendering showing the Town and the surrounding San Juan Mountains. This image has a great rendition of the "valley haze" effect, described here and here. Telluride sits in the foreground valley. 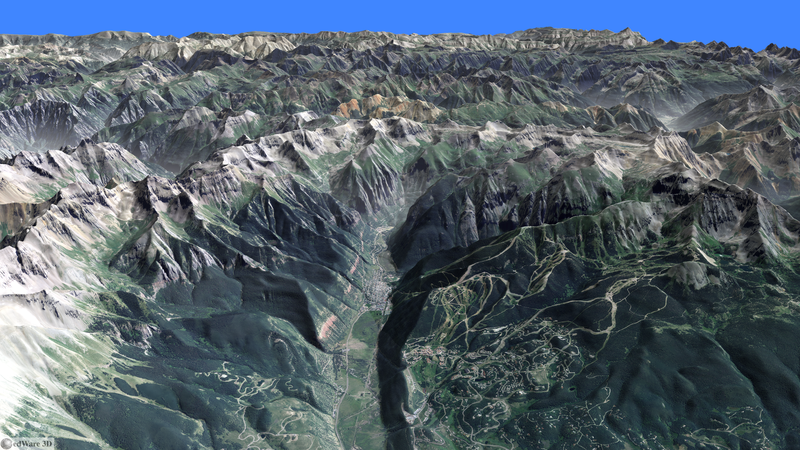 The Telluride Ski Area lies on the mountainside to the S (right on the image.) Mountain Village is the development on the hillside in the immediate foreground. Here's hoping for a great ski season this winter! Once on the image map site, mouseover a trail (you'll have to click (tap) on a mobile device) to get the trail name. Longs Peak (14,256) is the major landform that bounds Glacier Gorge on the SE. This entire area is a specular destination for climbing - both summer and winter. Click the image for the high res version. 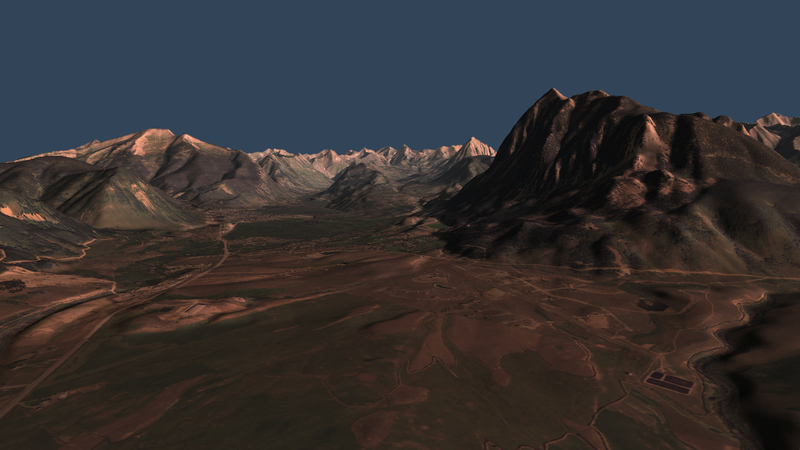 This view shows five of Colorado's fourteeners. Mt Yale (14,196) is the prominent peak just left of the image center (the white spot along its flank in the foreground is a cloud "draped" over the terrain). Mt Columbia (14,073) and Mt Harvard (14,420) are the prominent peaks just right of image center. Mt Belford (14,197) lies slightly in the background to the right of Harvard and Mt. Oxford (14,153) is to the right of it. Despite their lofty elevations, all these peaks are easy hikes, but well worth the visit. The recently designated Collegiate Peaks Byway follows Highway 285 along the Arkansas River Valley.